Considering the number of Camino de Santiago routes, and the fact that many people don't complete an entire route, traveling along this ancient Spanish network of pilgrims' ways can take anywhere between a few weeks to several months to complete. 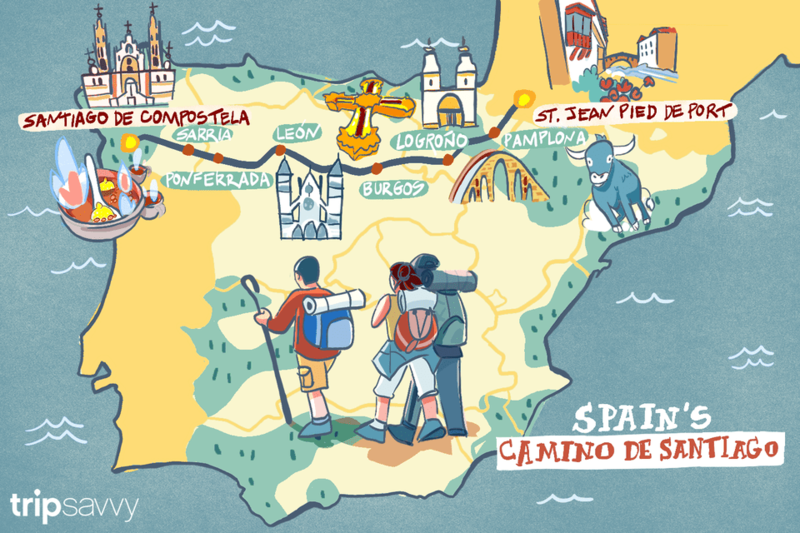 However, if you plan on doing the whole of the most popular route of the Camino de Santiago, the Camino Frances from St. Jean Pied de Port in France to Santiago de Compostela in Spain, the walk should take you about 30 to 35 days; in order to achieve this time, you would need to walk between 23 and 27 kilometers per day (14 to 16 miles). Also known in English as the Way of Saint James, the Camino de Santiago serves as a pilgrimage—very much like the Jewish birthright trip—to the shrine of the apostle Saint James the Great in Galicia at the cathedral of Santiago de Compostela. There are a number of great places to start the Camino de Santiago, so depending on how long you have to experience this adventure, you may want to select a shorter or longer destination for your first leg of the journey. Whether you're taking the full pilgrimage or just part of the journey, walking along the Camino de Santiago in Spain offers visitors a number of great sights and opportunities for cultural experiences. As a result, you'll never want to rush when you're on this trip so make sure you have plenty of time to really soak in the culture around you. You'll definitely want to sample some of the fine seafood of the region or take part in a traditional queimada, which is a ritual used to ward off evil spirits through drinking a smoking concoction—plan for an extra night or two if you really want to immerse yourself in these cultural experiences. This region of Spain has also gained international attention for its burgeoning modern art scene, so be sure to explore the museums and exhibits to get a taste of this wave of artistry coming to the region. If you don't plan on doing the whole of the Camino Frances, there are a few questions you need to ask yourself including how much time you have to spare to do the journey, whether or not you're available to come back in the future to continue your adventure, and if it is extremely important for you to reach Santiago de Compostela on this trip. Pamplona to Santiago de Compostela takes about 28 days and allows you to stop over in Vitoria-Gasteiz, the seat of government for the Basque Autonomous Community, where the Gothic-style Santa Maria Cathedral and 17th-century Plaza de La Virgen Blanca are located. Logroño to Santiago de Compostela takes about 25 days and originates in one of the pilgrim's way's most popular cities where visitors can take in the spires of the Cathedral of Santa María de la Redonda. Burgos to Santiago de Compostela takes about 20 days, but visitors should start their journeys by first exploring the medieval architecture of the provincial capital of Castile, Burgos, where the French Gothic Cathedral of St. Mary and the Chapel of Condestable are both popular destinations. León to Santiago de Compostela takes about 12 to 14 days, and León is home to the 10th-century Basílica de San Isidoro, which contains the royal tombs of the province's historical rulers. Ponferrada to Santiago de Compostela takes eight or nine days; visit the Castillo Templario de Ponferrada (Castle of the Knights Templar) to experience some of the histories of conquest which defines Spain's modern culture before heading off on the Pilgrims' Way. Sarria to Santiago de Compostela takes four to seven days and originates in one of the most-populous cities in the region; take some time to enjoy the culture and architectural marvels like the Iglesia Santa Mariña de Sarria, the Sarria Peregrino, and the Iglesia de San Salvador. St. Jean Pied de Port to Pamplona takes three days and is often the first leg of many traveler's journeys down the Camino Frances route; be sure to stop by the Pilgrim's Office for maps, guides, and more information about what to see on this leg of the journey. St. Jean Pied de Port to Roncesvalles is an even shorter day-trip to get your adventure started, which is perfect if you want to see what the Camino de Santiago is like but hope to return later to complete the full, long journey. Pamplona to Logroño takes four days and takes your right through Estella-Lizarra, a town founded in 1090 that features Romanesque art, rich architectural history, and a variety of attractions like the Museo Gustavo De Maeztu and the Palacio de Los Reyes de Navarra. Roncesvalles to Estella takes four days and provides an even better opportunity to explore Estella; however, you should spend some extra time in Roncesvalles so that you can also check out this small rural village and its unique historical architecture. Roncesvalles to Pamplona takes two days, which provides plenty of opportunities to explore nature parks like the Roncevaux Pass and Urkulu Mountain near Roncesvalles. Logroño to Burgos takes five days and allows you to see both the Cathedral of Santa María de la Redonda in Logroño and the medieval architecture of Burgos all within a week. León to Ponferrada takes four days and grants you access to both the royal tombs of the Basílica de San Isidoro in León and the Castle of the Knights Templar in Ponferrada. León to Astorga takes two days, which is the perfect amount of time for a quick trip to see Astorga's Chocolate Museum and the Episcopal Palace, a Gaudi-designed palace, and an art museum. Astorga to Ponferrada takes two days and can either be completed as a part of a journey from León or as its own stand-alone tour of two of the area's largest towns.